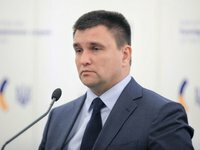 Ukrainian Foreign Minister Pavlo Klimkin has said that he is in favor of the possibility of dual citizenship for the Ukrainian Diaspora. "As a matter of fact, I'm standing for dual citizenship for such Ukrainians and consistently speaking out in favor of it. I think that we should just think over the criteria. Of course, we should make way toward it," Klimkin said on the Radio Culture, answering the question about dual citizenship and the Ukrainian Diaspora. He noted that Ukraine is losing thousands of Ukrainians who could work, not leaving the country, not only in government or some bureaucracy bodies or business, but also create modern Ukrainian culture. "Many people understand us, Ukrainians, through Ukrainian culture. They look at us, our culture and thus understand who Ukrainians are, why Ukraine is a unique country, why Ukraine is the only one capable of fighting Russia," the foreign minister said.